Have you ever noticed the copper cable plugged into your computer? Or to put it specifically, the crystal connector in your computer? That’s what we called RJ45 connector. What is RJ45 connector? It’s a common component used to connect computers into Ethernet-based local area networks (LAN). But how much do you know about this simple connector? Let’s get together to make sense what it looks like and how to terminate Ethernet cable with it. RJ45 connector is the most common twisted-pair connector for Ethernet cables and networks. The letter “RJ” represents “registered jack” which is a standardized physical network interface for connecting telecommunications or data equipment. 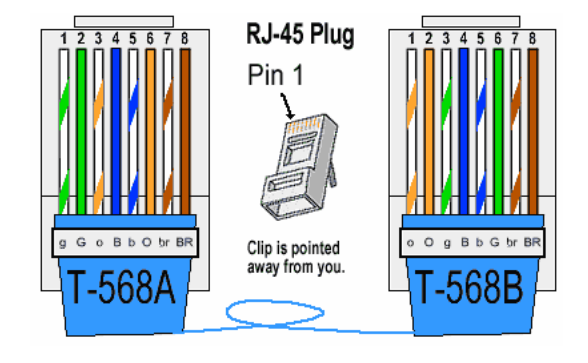 RJ45 connector features eight pins for wires to interface, and eight positions, spaced about 1mm apart, into which individual wires are inserted using special cable crimping tools. This type of connector is so-called 8P8C (Eight Position, Eight Contact). Several other types of connectors closely resemble RJ45, and someone may easily feel confused about them. For example, the RJ11 connector used with telephone cables is one of such connectors. But this connector only uses six positions rather than eight positions, which make them less popular than RJ45 connectors. 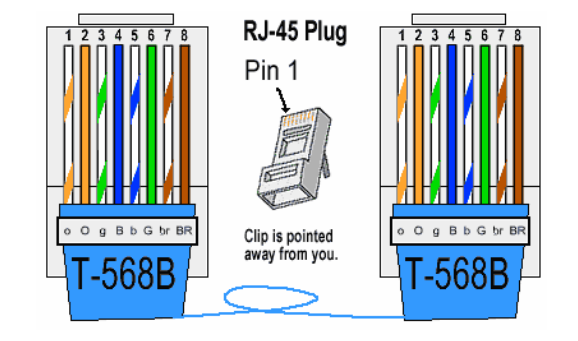 As we all know, when linking RJ45 connector to a cable, there are two wiring standards that define how the RJ45 pinouts to arrange the individual eight wires—the T568A and T568B. With regard to the two standards, there are two different connectivity forms. If both ends of the patch cords are wired on the basis of one standard, it is a straight through connection. If not, it is a crossover connection. Both the standards can be used for straight through cable. 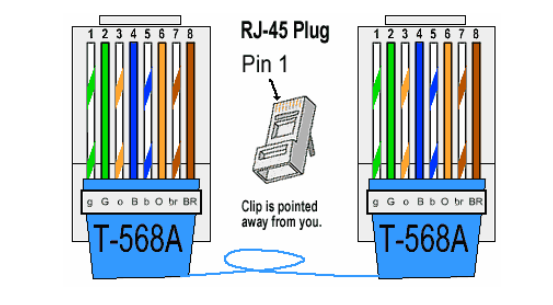 Here is an illustration for the color code of RJ45 connectors when they are deployed in different connections. No matter with the standard T-568A or T-568B, once the color order on one end is defined, so does the other end, which means the color order is same on both ends. Take T568A straight through connection for example. The color order of one modular plug is green/white, green, orange/white, blue, blue/white, orange, brown/white and brown. The color order of another modular plug must be corresponding with it (showing as the following picture). So does the standard T568B. Look at the following picture. This connection is different from the straight through one, for the color order is different on both ends. It’s no need to spend time remembering how many color orders there may be in this connection. Because you can get a crossover connection by wiring one end using T-568A standard and the other end using T-568B standard. Just like the following picture shows. Or remembering the color coding by simply switching the green set of wires in place with the orange set of wires. Put it in simple terms, switch the green (G) with the orange (O), and switch the green/white with the orange/white. If you have experience to install or maintain cables in LANs, you may know how important to terminate Cat5e, Cat6 or Cat6a copper cables with RJ45 connectors. Mastering this skill sometimes can save time as well as money in Ethernet cable installations. Here is a simple tutorial. Step two. Separate the 4 twisted wire pairs and unwind each pair. Flatten the wires as much as possible to make preparation for proper individual insertion into the connector. This post introduces the basics and color code of RJ45 in different connections as well as how to terminate Ethernet cable with it. 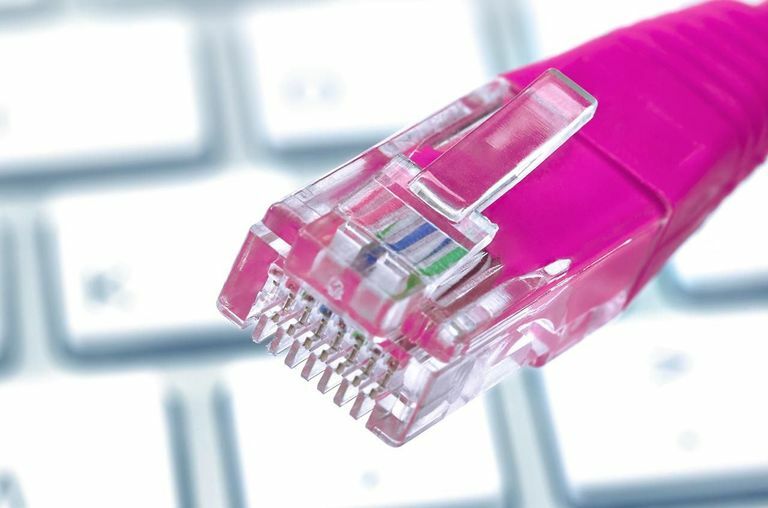 As Ethernet systems provide flexible and effective ways to transmit voice and data media, RJ45 connectors, as a key part of Ethernet connectivity, are becoming more popular. Therefore, having a good command of knowledge about it is beneficial. With the growing demand for high bandwidth and network systems venturing into new areas such as factory environments, the need for copper cables is also on the rise. Category 6A cable, as a new infrastructure performance, has been widely accepted in 10G networks. Then how to select the one that will provide the characteristics needed? This article may help you get the answer. Category 6A, also refer to Cat 6A, is a standardized twisted pair cable designed for Ethernet and other network system. Compared with Cat 5e and Cat 6, Cat 6A can double data transmission bandwidth from 250 to 500 MHz, reduce the chance of crosstalk interference, and offer superior reliability and transmission speeds through longer length of cable. For example, Cat 6A supports 10gBASE-T to 100 meters in channel length, which makes sure that it can be deployed in the fastest Ethernet applications. Different from Cat 6 cables, Cat 6A cables are often shielded, making them ideal for industrial applications where additional interference may be a concern. There are various kinds of Cat 6A cables in the market such as round shielded and flat shielded. And many factors may affect the performances of Cat 6A in network systems. Here are the important considerations to weigh when choosing a Cat 6A cable. 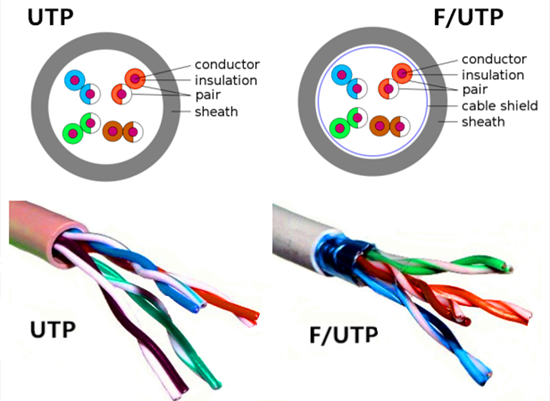 There are two types of Cat 6A cable: unshielded (UTP) and shielded (F/UTP). UTP cable is the common unshielded cable. While the F/UTP means the cable consists of 4 unshielded twisted pairs. However, it contains an outer foil shield. Due to the use of fillers as a barrier against alien crosstalk, UTP cables tend to be larger in diameter than shielded cables, which means they need more investments to support the extra conduit and hanging devices. Generally, Cat 6A seems to be a better choice for 10G networks. But they are vulnerable to installation abuse as the position of the pairs inside the cable may be changed, affecting the proximity of the pairs and their position relative to the overall foil shield, thus changing the transmission properties of the pairs. So it’s important to choose the suitable one based on your practical applications. Due to the higher operating frequencies of Cat 6A, Cat 6A cables are larger than Cat 6 cables. Large size means fewer cables can fit into a cable tray or conduit, which is a problem that must be considered when selecting Cat 6A cables. 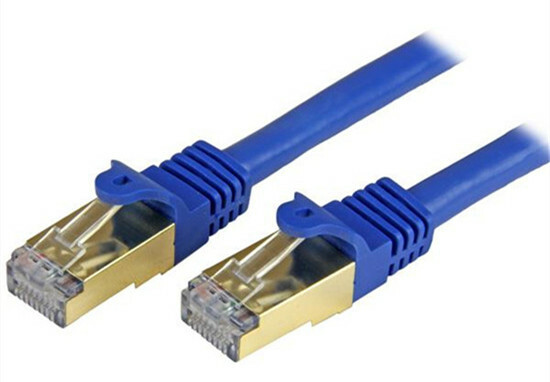 As we all know, because the Cat 6A cables have more twists in copper pairs and thicker outer jacket, most of them are larger than common cables. Therefore, more time is needed to install and terminate those cables. Making a proper plan to do Cat 6A cabling is necessary according to the project process. When delivering PoE, some small-diameter Cat 6A cables may not support the full 100m distance per-channel. However, there is no doubt that Cat 6A cable can support full 100m distance in other data transmission. A cable that can handle the full 100 meters not only provides an extra margin of performance, but supports a wider range of data center configurations including top-of-rack, end-of-row and middle-of-row configurations. So you can decide whether to deploy Cat 6A cables according to your requirements. A cable that has larger cable diameters also comes a larger bend radius, which is important when routing cables in tight spaces such as inside wall cavities. 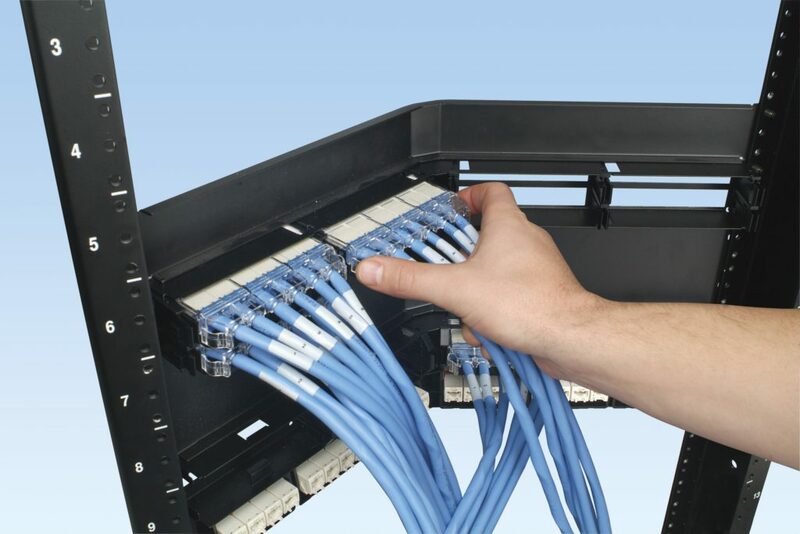 The bend radius also has an impact on the ability to route cables for maximum airflow within racks. The smaller the bend radius, the easier the cable is to route and install. CAT6A is currently a good choice for 10GbE networks. It’s essential to evaluate the current and future throughput needs before selecting the appropriate Cat 6A cables. It’s known to all that cable infrastructure is complicated and costly to replace if upgrading is necessary. Hence, before choosing a Cat 6A cable, all factors should be taken into consideration so that your installed systems can get optimization! Why You Need Pre-terminated Copper Trunk Cable and How to Choose It? How long have you ever spent on cable installation? As we all know, cable deployment in the network is a time-consuming work. However, with the help of pre-terminated systems and components, you can cut installation time effectively, for there is no need to do field terminations or splicing during installation. Now, this article focus on one of the pre-terminated cables—pre-terminared copper trunk cable. In simple terms, pre-terminated copper trunk cable is a kind of cable which has gone through the same procedures with other cables, but their connectors have already been terminated, properly polished, and the entire cable assembly tested on either both or one end in factory. Copper trunk cables are typically comprised of bundles of 6, 8, or 12. Since they are bundled together, there is no need to worry about cable mess. Pre-terminated copper trunk cables provide a quick “plug-and-play” solution for links between switches, servers, patch panels, and zone distribution areas in the data center, and they are preferred when the cable distances are less than 100 meters and cable lengths are pre-determined. Here is a picture of pre-terminated copper trunk cable. Besides, the common types of pre-terminated copper trunk cables are Cat5e, Cat6, Cat6a, Cat7, etc. And different types have different advantages and specifications. All of them are necessary elements for data transmission in the enterprise and data center networks. Why You Need Pre-terminared Copper Trunk Cable? In today’s workplace, quick and easy cable installations that guarantee reliable performance are more critical than ever. When compared to field-terminated cabling, there are many reasons to consider pre-terminated category-rated cables in copper network. It’s know to us that field termination is time-consuming in cable installation. If not use pre-terminated cables, much time would be spent on cable packages and connections. According to some figures, deploying pre-terminated cabling can reduce installation time by up to 75 percent over field terminations. During a cabling installation, installation and transmission performance testing cost too much time. However, pre-terminated copper trunk cables are terminated in factory, and many of them are provided in a cassette format. This format allows installers to “plug and play” multiple connections with one cassette, which reduce installation time obviously. Besides, transmission testing has been performed by manufacturers before shipment, which also reduces time when installation. Pre-terminated trunk cables contribute to data center modularity and consistency, making cabling more accessible and organized. And they also remove excess loops, thus storing excessive slack is not a concern. Of course, apart from what have been mentioned above, there are also other benefits for applying pre-terminated copper cables such as space saving, cost saving and labor saving. In a word, pre-terminated copper trunk cable deployment benefits cable installation a lot. We have known the benefits of using pre-terminated copper trunk cable. But do you know how to choose a suitable one? Here are several factors you should consider when choosing a right copper trunk. There are different problems may arise in data center and fire is one of them. So there is a need to consider the fire ratings of material. Generally, a riser environment is very common in data center, for in there airflow is not a consideration. But some areas such as drop ceilings and raised floors often require plenum-rated cable which can facilitate air circulation for heating and air conditioning systems. The termination type of the cable assembly depends on the layout of the data center or telecommunications room, and the design philosophy employed. Different types have different requirements for installation. Common termination types are jack-to-jack, plug-to-open-end, jack-to-plug and plug -to-plug. 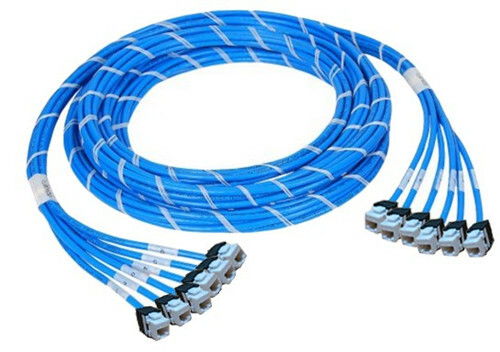 A proper breakout length, referring to the length from the end of the braided sleeve to connectors at the end of the cables, offers the flexibility to route the cables as needed. So it’s important to have a right breakout length. In addition, cable length and the alignment also should be taken into consideration. Of course, how to choose a suitable pre-terminated copper trunk cable also should depend on your real applications. Pre-terminated copper trunk cable provides a perfect cost-effective solution for enterprise and data center applications. Choosing a right one will help you resolve many unnecessary problems during installation process.